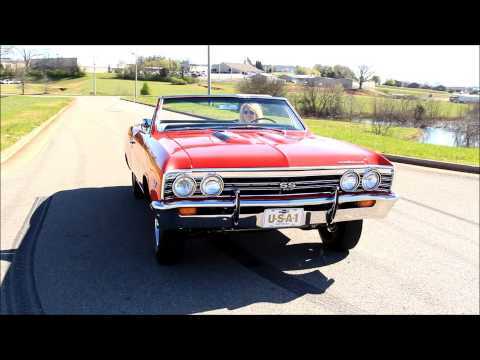 For sale we have a 1967 Chevy Chevelle Super Sport Convertible that features an Aluminum Head 396.This car has had a full frame off resto with painted floors. The body was pulled off the frame and stripped to the metal top to bottom. The panels were then reinstalled to ensure a good fit and everything was covered in the Bolero Red that has been buffed and polished to a deep rich shine. At that time all the chrome and stainless was either replaced or polished. Before the new white top was installed the top frame was cleaned and painted. The top is power and working as it should. This Chevelle has many extras such as power trunk and chrome bumper guards front and rear. On inside it's done in white and black that provides the perfect complement to the exterior. It has the correct seats that are done in white that flows perfectly whether the top is up or down. Also it has the correct Console with the Muncie 4 Speed Shifter with lock out reverse. When you look at the dash it has the gauge pack instrument and blinker tach. Also it has Tilt Column with the Rose Wood Wheel. Under the hood it has the 396 with GM Aluminum Heads. It has the snow flake Aluminum Heads and intake with Chrome Valve Covers and the factory Air Breather that pulled cool air from under the windshield. The trans is a Muncie 4 Speed that is mated to the 12 Bolt Rear End. This Chevelle comes with Power Steering and Power Disc Brakes. Before the body was put back on the frame they did a complete build on the frame with fresh black paint and all new bushings. Also a new fuel tank as well as new fuel and brake lines have been installed. If we can help you in any way with questions or a specific picture, you can call our office at (865)988-8088. Or feel free to call Devvin at (865) 256 2366, or you can e-mail us at sales@smtclassics.com.